Make your '04-Current Ford F-150 stand out from the rest with this great-looking Harley-Davidson1 stylized Body Side Graphic kit. Kit is PRECUT and ready to install in a wide variety of colors. Slight trimming required at Rear Door jambs as well as Cab/Box connection2. As you can see, graphic package is not just a generic set of stripes. Kit is specifically made for the '04-Current Ford F-1503 and will not fit any other vehicle. 1 Graphic offered herein is simply stylized after the graphic offered on the 2011 Ford F-150, Harley-Davidson' Version Package. It is not offered as a replacement kit. Auto Trim DESIGN is not affiliated or otherwise connected with H-D Michigan, LLC. 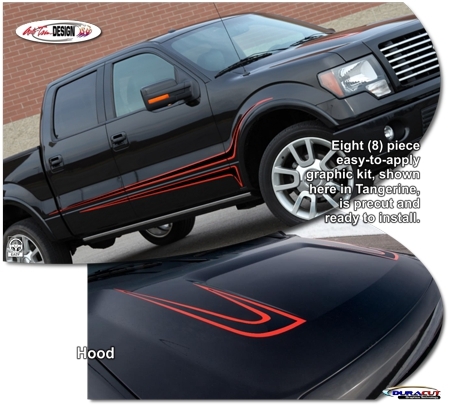 3 While graphic has been specifically designed and fit to the '09-Current Ford F-150 body, kit will fit the '04-'08 Ford F-150 with slight trimming and fitment adjustment(s).